Everyone loves to entertain through the holidays, and food is always an important part of the festivities. With a multipurpose grill that is ready in about 15 minutes, you can move the cooking outside and have delicious food prepared quickly. Grilling and smoking are healthy cooking methods which impart a great deal of flavor without extra fat, which makes meats cooked in one of these manners better for you. Using an outdoor smoker, you can put a turkey or roast on in the morning, and let your gourmet guru grill do the heavy work. When it’s done, just slice and serve for easy entertaining. Practically everyone needs additional oven space during the holidays, which makes your outdoor oven a valuable appliance. Don’t just think meats, you can also bake your pizza or a cobbler for dessert. Baked beans or corn on the cob also benefit from that smoke flavor from your grill. Kamodo style grills offer more cooking flexibility in small spaces over traditional grills. They are ready quicker and have the ability to reach different temperatures more effectively. It produces less ash than briquettes, making it easier to keep clean. During the holidays, you don’t need one more thing to maintain. When it comes to ceramic grills vs traditional grills, the ceramic grill combines the efficiency of charcoal with a grill that cooks from all sides, more like an oven. This keeps the meat moister and gives you more flexibility in both direct and indirect cooking. It’s a totally different cooking experience that enhances the natural flavor of food. Even if the weather turns cold through the holiday season, turn on your ceramic grill and cook outside for a unique party. Make some apple cider or hot chocolate and let everyone have a snowball fight and make ice forts while you roast a turkey in your outdoor oven. When the party goes inside, everyone will be ready to relax and unwind. 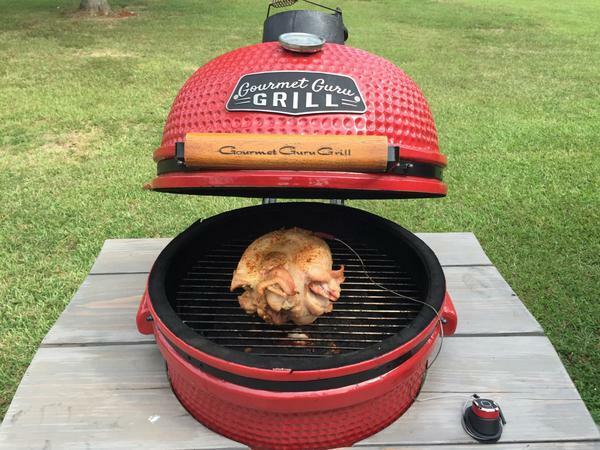 Give a gourmet Guru Grill as a gift to your favorite foodie. It’s something they can use every day of the year, well after the holiday season is over. During the summer, it makes even more sense to cook outside on the patio to keep the house cooler. The ceramic grill makes a great addition to any kitchen for additional cooking space.